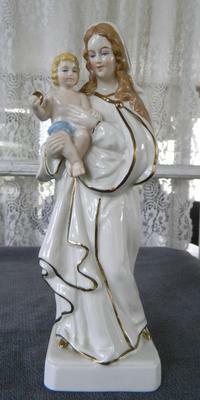 Religious Mary & Jesus Figurine mark query - Dresden above X with letters RW (the R is reversed):- Hello! Thank you for such a wonderful and informative site. I'm an avid garage sale and estate sale hunter, but am not very knowledgeable about figurines. 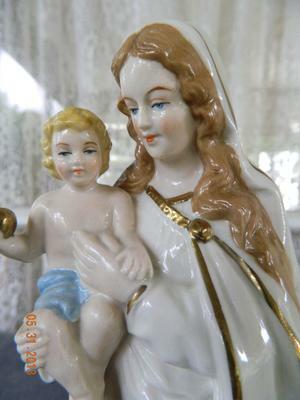 I purchased this Madonna with Child figurine at an estate sale where the woman had collected quite a few Dresden figures. I fell in love with the faces and thought the piece was well done. However, I have no idea as to its age or true origin. So far, I have been unable to identify the mark. I've searched all over the Internet without any luck. I don't know where to go next and am hoping someone here recognizes the maker or can point me in the right direction. I realize that there are many Dresden marks and also that the Meissen crossed sword mark has heavily influenced the designs of others marks as well as been outright copied. 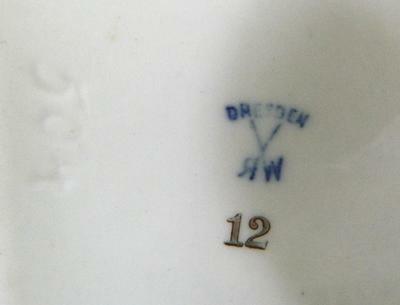 I'm hoping the RW initials on my piece mean that it is not forged piece, and was simply influenced by Meissen? Any help would be greatly appreciated! I can't quite pin this one down, but I feel it is a fun pastime to lay down a few wild guesses, following the clues, as Sherlock would say. find recorded as using a reverse R). 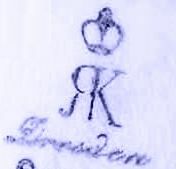 Famously Richard Klemm, leading Dresden decorator used a reverse R with his RK mark - and this mark may be paying some lip service to this famous logo as well as to Meissen's crossed swords. Rudolf Wächter of Kirchenlamitz, Bavaria used a RW mark - but not like this one as far as I know. Don't know much about them. The other to trademark an RW marking is the world famous Straus & Sons who liked Macy's department store so much they bought the company! They were big players with lots of different logos and brand names and several factories throughout Germany and Bohemia making lots of different stuff in the late 19th century and early 20th century. So the answer is I don't really know if this is a variation of the RW mark of Straus & Son, or it is a lesser maker of later years, but I hope to find out as this thread unravels its secrets. Please post it you know anything.